I really like pancakes. I also really like rocks. So when I found out there’s a natural phenomenon on the west coast of New Zealand’s South Island called The Pancake Rocks, I knew I was going to have to pay a visit. The pancake rocks are perched on a tiny coastal outcropping near the town of Punakaiki and do a lot to live up to their name. The rocks are made of a series of limestone “pancakes” that were originally laid down in a process called stylobedding, which is scientist speak for “we have no idea how this happened.” Over time the layers have been eroded away to form a rock garden of fantastically sculpted shapes. In some places the rocks have been eroded all the way down to sea level. 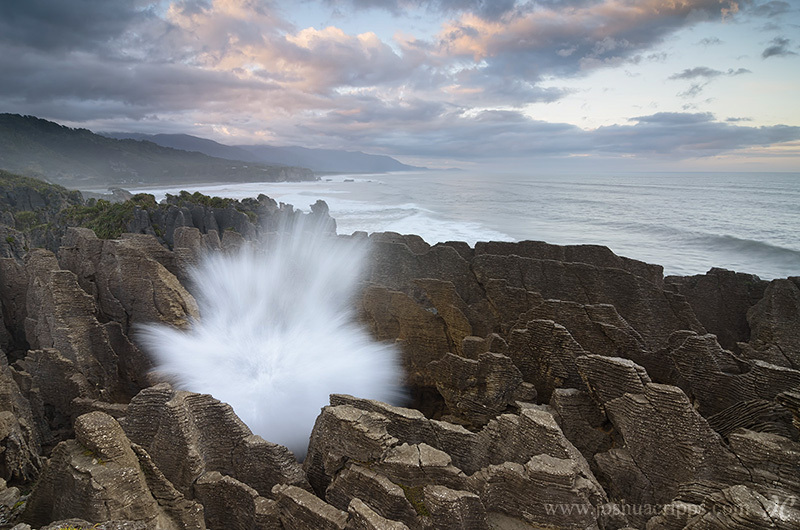 So when the big swells at high tide come booming in, the water shoots out through the pancake rocks in a series of blowholes, the most spectacular of which is the Putai Blowhole. You have to be a bit careful while shooting the blowholes though, because as I learned, the wind and the fallout from these big blasts can fairly cover you and your gear with Ocean’s Breath.